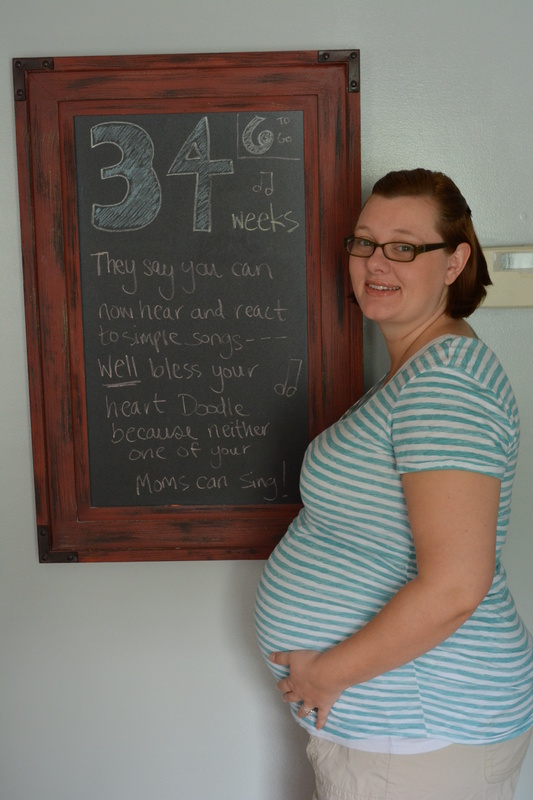 34 weeks has been a busy one for us! With work and bunches of other stuff going on we have been very very busy! We went to a newborn care class on Thursday–mainly for my benefit because Machelle is very well versed on how to do things like take care of newborns. She used to work in a peds office for 5 years and has a lot of experience with new moms and dads freaking out about what could be wrong with their child. I, on the other hand, have never really babysat and I was the youngest child. Doing things like changing diapers and swaddling babies comes pretty naturally to Machelle and I am hoping that it will be a science that I can quickly adapt to. We also had a midwife appointment where we discussed more about labor and things to expect when you get to the hospital and when you get back home. 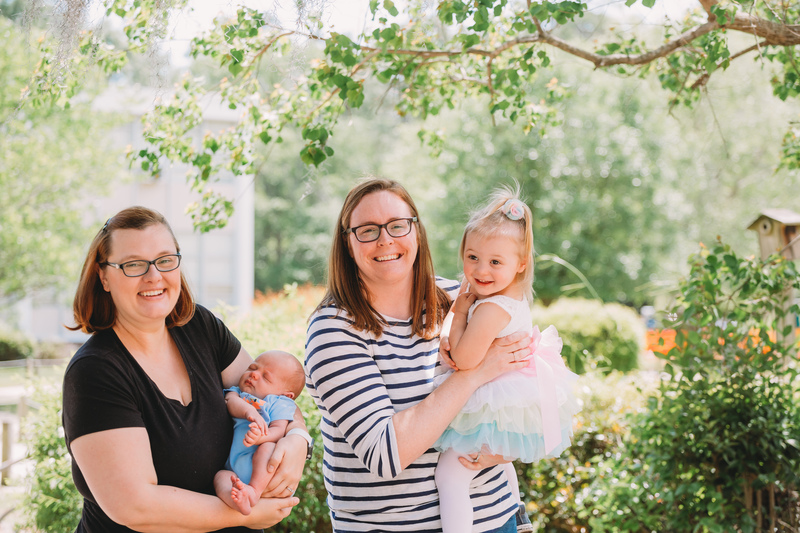 The midwife told us that we need to have a plan for how we are going to eat, do chores, and get people who can support us in this transition because we will only be focusing on taking care of the baby. I know that it seems very presumptuous of me to think that I will be able to handle the chores that absolutely need to be done, but I think this week I realized that I am also going to have to consider taking the help that people will be offering. So–anyone that wants to come over and clean the house or take the dogs for a walk, you are more than welcome to start now!! On a serious note, I worry more about when I have to go back to work and Machelle is here by herself with the dogs and baby. I know she will be fine and we will figure out what works best for us, but until that becomes second nature I am sure there are going to be times that we both just feel incredibly overwhelmed. We are both so incredibly ready to see the baby and it doesn’t help when we see people in public who ask the due date and then, with looks of amazement, say things like “Looks like you are due right now!” They say that statistically, most 1st time moms hold on to their babies a little bit longer, but it just seems like this baby may make an entrance a little early in to the world. As long as the baby is healthy, we are fine with that! On Friday, my work threw a shower for Machelle and me and it was so amazing. They were all so great and generous and amazing! It really makes you feel good that the people that you spend the most amount of time with outside of your immediate family are so supportive and amazing. They had tons of food and Doodle got TONS of presents! We are beyond fortunate in everything that we have received in preparation for this child. We have spent hardly any money on this child and we have pretty much everything that we need to make sure that this baby survives at least for the first 3 months. Machelle’s work shower is on August 20th–and we are hoping that she is still pregnant then. She says that she is a little uncomfortable walking around or trying to get comfortable, but for the most part is still doing really well. The mood swings have increased a little bit this week, but they can usually pass within a few hours. Full disclosure, the below is stolen from @ladyloveandbabydust- I like the way she always updates this weekly and wanted to give it a shot. Sleep: Drinking a lot more water during the night and that makes me have to get up to pee more. Food cravings: All food tastes better to me. The flavors are just more intense. Got some re-assuring news from midwife that I am very low risk and they aren’t going to discharge me. Really liked that Mary learned how to use one of the baby wraps and am looking forward to seeing her use it. Hopefully having our maternity pictures taken tomorrow, if the weather cooperates. It’s also my birthday on 8/8 and I will be the big 30! Looking good! Your midwife is right about having support right out of the gate, it made a world of difference for us. If you don’t have the support you feel like you need, it is worth getting a part partum doula of you can afford it. Hey and happy early birthday – I’m the 6th! Leo’s rock. I also kind of feel like I should be able to handle the essential household tasks; but we’ll have family on hand, so it’s good to know that we’ll have back up. I don’t quite understand how it works, but it sounds like when you have a newborn you enter some kind of time warp and everything moves quickly and slowly at once and getting things done is a momentous task. 1) she does NOT look like she’s ready to have that baby, people are odd. 2) your welcome to “steal” from me anytime, how do you think I came up with that lol. 3) she looks beautiful as all get out and I cannot wait to meet your little one but I hope the stay put so there’s no NICU time. I can’t wait to see your maternity shoot as well, relax and have a good time but don’t be afraid to say you want another pose or position cause looking back I was too quiet. Previous Previous post: 33 week update!! !